I am a survivor of the Holocaust. I faced the most extreme adversities that you can imagine, by being locked up in a hellish environment in which I encountered the danger and probability of being killed one way or another on a daily basis. I was an eyewitness to the many faces of depression. Suicides were rampant among us prisoners, due to the almost intolerable conditions of our camp life. I also experienced severe depression and I had to fight it fiercely in order to stay alive under the horrible circumstances and great suffering to which I was subjected during my captivity in the three German Concentration camps: Auschwitz-Birkenau, Bremen and Bergen-Belsen. I had to devise methods which I call Tools of Survival, in order to have the physical and emotional strength to go on. I had to believe that with these tools I could miraculously survive under those horrific conditions in the camps. 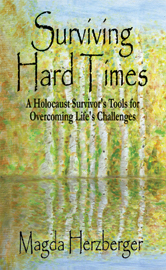 I also will relate to you how I coped with the loss and grief I faced by losing my father and so many members of my family in the Holocaust. My desire is to help people in overcoming their tough challenges and have the courage to go on and make appropriate changes in their lives, necessary for their wellbeing and survival.